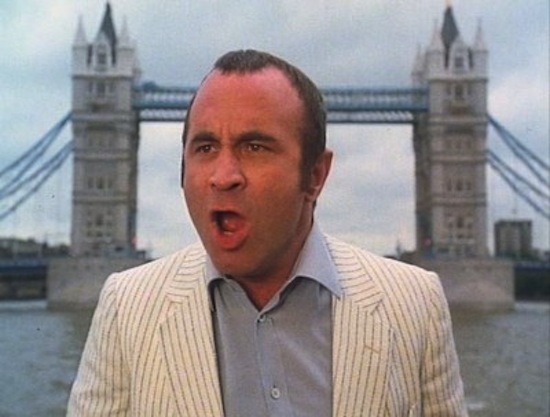 The Long Good Friday (John Mackenzie 1979/80) provided Bob Hoskins with his breakthrough role. His character, Harold Shand, is a villain from London’s East End who has a grip on organised crime in England’s capital and an obsessive ambition to create lasting wealth and legitimacy by obtaining abandoned docklands property and on-selling it as a site for an 80s Olympics. To help him do this, he courts an American Mafia boss (Eddie Constantine) presenting him with a promissory corsage of ‘hands across the ocean’. The story, and therefore the film, has a touch of genius about it. As the events of Good Friday unfold, many things are revealed. When Harold’s empire is threatened by unknown assailants, Harold reverts to type; his ’10 years of peace’ in the London underworld, of which he is so boastful, is roughly put aside in favour of torture and threats. Harold is desperate to find out who is bombing his buildings and killing his lieutenants. And although what we see is brutal, it is also very funny. Barrie Keeffe’s screenplay and John Mackenzie’s direction enable Hoskins to invest Harold with elements of both Bertolt Brecht’s Arturo Ui and Johnny Speight’s Alf Garnett. So at once, the manner of Harold’s protestation that ‘you can’t crucify people on Good Friday’ serves to destroy the notion that great killers may command respect through the device of having him complain about the car bomb in a way that a disgruntled West Ham fan might when the referee disallows a goal. But Keeffe and Mackenzie are shrewd enough to realise that there has to be more to Harold than just a vengeful cockney vulgarian. His scenes with his lover, Victoria (Helen Mirren) are tender and their beauty and the beast relationship is complex. Her radiance and intelligence are at odds with everything that Harold is, or ever will be. But these fine actors make it work, make it credible, infuse the characters with emotional depth. Toward the film’s conclusion, the two are parted as Harold’s world collapses around him. At that moment of realisation, the shared anguish is palpable. It jolts us back into our own sometime world of unplanned consequences. But the film’s ultimate triumph – what sets it apart – is how it resonates down the decades. Not just in the way that other characters such as Arturo Ui and Alf Garnett are invoked but in how Harold’s ambitions to make Britain great once more through exploitation and corruption so perfectly coincide with the arrival of Margaret Thatcher, Reaganomics and the greedy eighties. The metaphors abound and, planned or not, lend the film a preternatural quality, ensure its greatness. An enduring masterpiece. On the subject of resonance, I do believe that Peter Greenaway’s The Cook, the Thief, His Wife & Her Lover is the perfect companion piece to The Long Good Friday. Made 10 years later, in 1989, this black comedy’s central character, Albert Spica (Michael Gambon), is a violent criminal who has gourmet pretensions. Helen Mirren’s presence amongst the cast lends further symmetry. 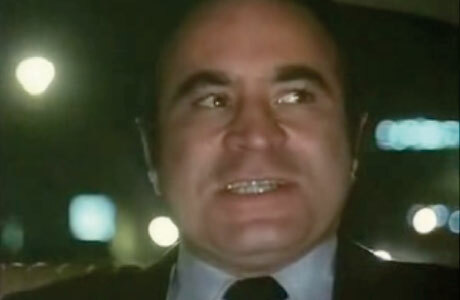 This entry was posted in Film and tagged Alf Garnett, Bob Hoskins, Helen Mirren, London. Bookmark the permalink. Sounds wonderful… definitely put this one on the list too! Let me know what you make of it Lis.